Pictured with some not-so-lazy homemade red date-ginger tea. Within my first week of arrival to Seoul last January, one of the first lessons with which I was inculcated as an intermediate Korean language student was that “한국 음식은 손이 많이 간다 (Korean food is very labor-intensive).” I suppose that might be the case if one is following the fold and striving for perfection in all things. However, I personally don’t see what all the fuss is about, because pretty much all the food that I make in Seoul takes about ten minutes, which is approximately the length of my attention span in the kitchen. Now, the obvious solution to this riddle is that what I’m making during these lightning rounds at the stove isn’t actually Korean food, for all the bags of bean sprouts and kimchi and buckets of gochujang (magical Korean hot pepper paste that makes everything taste good*) I run through like water to make it. To which I would counter, yeah, okay, but it uses Korean ingredients, is reasonably tasty, and shares enough of the general features of what I have seen in restaurants and on various Korean kitchen tables that I’m most comfortable categorizing it as Korean if I have to categorize it at all. I’m fairly pleased with the results of these recipes, so I’d like to share some of my findings with other busy and culinarily lazy friends, especially those fellow expats in Seoul who would like to start using some more local ingredients in their food but aren’t sure how, or those overseas who are looking for an exotic alternative to Hot Pockets and Chinese takeout (which, let’s face it, is just not that exotic anymore). So let’s start with my lazy corruption of the ubiquitous doenjang jjigae. 1. Put sesame oil and water into pot. Bring to a boil. 2. Wash the garlic cloves; cut off the ends (don’t bother with a knife if you can use cooking scissors) and boil until 70% soft. 3. Wash the bean sprouts; add to the water and cook for one minute. 4. Add the doenjang and gochujang. They’ll stick to your spoon (and your finger, should you use it in a lazy attempt to clear the spoon); just stir the utensil in the hot water for a few seconds until the sauce is dissolved. 5. Add the kimchi, then the egg. If you stir, it will redistribute evenly and thicken the broth. If you don’t stir, you’ll have a nice poached egg surprise in your soup. The choice is yours. If you’ve been made paranoid by multiple brushes with egg-induced food poisoning like me, you’ll boil until hard (2-3 minutes). 6. Add the laver and miyeok. Take care not to boil for longer than a minute or so, or the nutrients will be lost. 7. Pour into a bowl and eat with something resembling rice. The proper way to do this is to gather a mouthful of rice in your spoon and dip it into the jjigae for flavor and extra ingredients before bringing it to your mouth and praying that you’re not going to sear a hole through your cheek with the still-boiling (but oh so delicious) soup. Note 1: Ingredient quantities have all been shamelessly fabricated after the fact. Note 2: Part of being lazy is not going to the store if you don’t have these exact ingredients. Just omit it or add something else. What’s important is that you have some sort of protein source (bean sprouts, the egg, and the doenjang in this case) complemented with high-fiber vegetables. And that you can eat it. And since it’s doenjang jjigae, that you use at least some doenjang. And that it looks sort of like soup (so add enough sauce to thicken the base, but don’t cook away all of your water). Note 3: Most doenjang jjigae has some kind of meat, usually beef, tofu slices, and zucchini. I have omitted the former because the use of meat automatically makes a dish less lazy, and the latter because I ate way too much bean curd during my college years (thanks, HUDS salad bar) and am now generally averse to consuming it unless I have to. I didn’t add zucchini because I don’t have any. See Note 2. 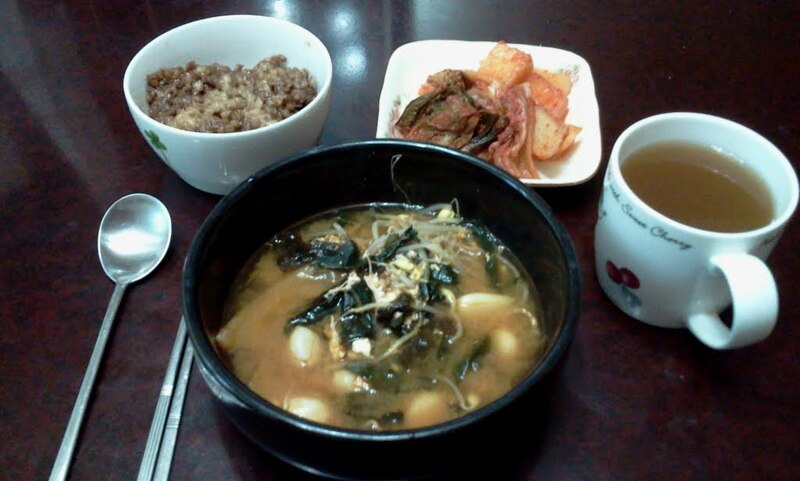 Note 4: Real doenjang jjigae typically doesn’t have any eggs or kimchi. Too bad. Mine does. Note 5: This really isn’t doenjang jjigae at all. Just jjigae with some doenjang. But thanks for reading. *I have not yet tested this hypothesis on ice cream. I will at some point.